Bangladesh Cricket Board president Nazmul Hasan said that they are not looking to risk Shakib al Hasan for the third Test against New Zealand, and will instead look at getting him fully fit for the World Cup in England later this year. "I don't think it's absolutely necessary for him to play the third Test because the World Cup is coming up," Nazmul told reporters. "If he has a problem then we want him to recover fully before returning to cricket. We don't want to take any risks with him." "We want him to play in both the IPL and for the national team. The whole thing depends on his fitness," Nazmul added. 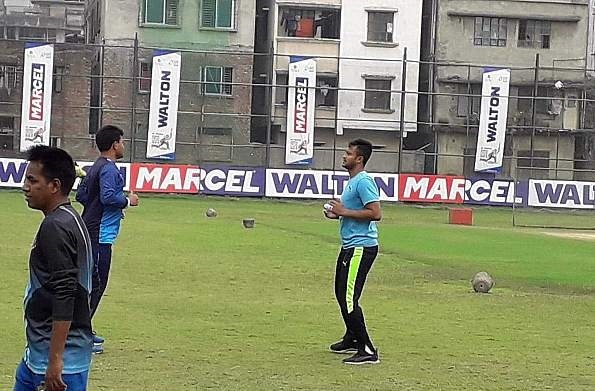 Shakib, however, began his rehabilitation at the academy premises a day after Nazmul made the announcement regarding their plan with the all-rounder, which needed the player to take an extra week's rest. The BCB medical team had suggested on March 4 that Shakib needed to rest for one more week after reviewing the X-ray report. Whether he will be available for the third Test is yet to be determined but his decision to head to the academy premises to get back into shape physically through running and gym session only indicates the amount of urgency from his part to get back to the cricket ground. He even partook in bowling a little. When asked whether he is trying to make a comeback in the last Test against New Zealand, Shakib was non-committal. "I am not sure because at the moment it is not possible to tell anything about the injury," Shakib told Cricbuzz on Thursday. "Let's see where it ends up." According to a BCB physician, Shakib will have another X-ray on March 12 and only after that can they can be sure of his date of return. "He is improving quite rapidly. We will have another X-ray on March 12 and only then can we say something about his possible date of return. If we see the fracture is healed totally than he can start his batting," the physician said. "His main challenge is batting and fielding because though his pain has diminished substantially, still he is not fit to play shots all round the wicket," he said. BCB's strength and conditioning coach Morshed Hasan, who is currently in charge of Shakib's rehabilitation programme, mentioned that they don't want to rush the player's rehab and risk aggravating his injury. "He will do physical training for the next one week and later we will decide on our next course of action," said Morshed. "He is expected to run a while in the gym. Everything will organised to increase his strength and stability," he added.